The maps and graphs appearing in this summary describe streamflow conditions for water-year 2006 (October 1, 2005 to September 30, 2006) in the context of the 77-year period 1930-2006, unless otherwise noted. The illustrations are based on observed data from the U.S. Geological Survey's (USGS) National Streamflow Information Program. The period 1930-2006 was used because prior to 1930, the number of streamgages was too small to provide representative data for computing statistics for most regions of the country. In the summary, reference is made to the term "runoff," which is the depth to which a river basin, State, or other geographic area would be covered with water if all the streamflow within the area during a single year was uniformly distributed upon it. Runoff quantifies the magnitude of water flowing through the Nation's rivers and streams in measurement units that can be compared from one area to another. The runoff value for a geographic area is computed as the median runoff value for all streamgages in that geographic area. For example, the runoff value for a state is the median for all streamgages in that state, and the median for the Nation is the median value for all streamgages in the Nation. Each of the maps and graphs below can be expanded to a larger view by clicking on the image. In all the graphics, a rank of 1 indicates the highest flow of all years analyzed. Runoff in the Nation’s rivers and streams during 2006 (10.17 inches) was below the long-term annual median for the United States (11.93 inches). Nationwide, 2006 streamflow ranked 59 out of the 77 years in the period 1930-2006. Above normal streamflow characterized most of the Pacific Coast states, the Northeast states, and Hawaii. Below normal streamflow was prevalent in the Southern Plains states and some Southeast states. Some Northeast states recorded record high flow conditions during 2006 compared to the historical period. * Out of 68 years of historical data. ** Out of 63 years of historical data. 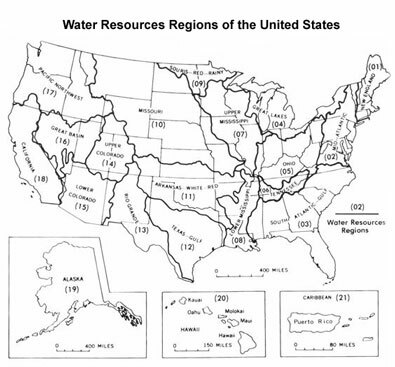 The United States (including Puerto Rico) is divided into 21 large drainages, or water resources regions. These hydrologic areas are based on surface topography and contain either the drainage area of a major river, such as the Columbia, the combined drainage areas of a series of rivers, such as the Texas-Gulf region which includes a number of rivers draining into the Gulf of Mexico, or the area of an island or island group. Water resources regions provide a coherent, watershed-based framework for depicting streamflow variations. In 2006, notable regional streamflow differences were observed along the East Coast. The New England region, for example, recorded its highest annual flow since 1930, reflecting the record high precipitation that fell on this area during the year. The South-Atlantic Gulf region, in contrast, was below normal. Below-normal conditions also were prevalent for most the Great Plains regions and Alaska. Autumn season (Oct-Dec) streamflow was normal nationwide (32nd highest autumn flows in 77 years). Four states reported new record high autumn streamflow: Maine, Vermont, New Hampshire, and Massachusetts. Winter season (January-March) streamflow was at the low end of normal for the Nation, ranking as the 53rd highest in 77 years. Normal or above normal streamflow occurred across the northern half of the conterminous U.S. and Hawaii, while below-normal flow characterized most of the southern states and Alaska. Spring season (April-June) streamflow was at the low end of normal (56th highest in 77 years) nationwide. Similar to the Winter season, Spring flows were normal or above normal in the northern states and below normal in the southern states and Alaska. Summer season (July-September) streamflow was in the normal range for the U.S., ranking 28th out of 77 summer seasons in the record. In any given month, on average, it is expected that five percent of the streamgages will experience very high (>95th percentile) and very low (<5th percentile) average streamflow. During water year 2006, three months (October , January, and June) had a greater number of streamgages than expected reporting very high flows (10, 14, and 7 percent respectively). In contrast, 6 months during the water year had a greater number of streamgages than expected reporting very low flows (February-April and June-August). In 2006, two percent of USGS streamgages reported new record high daily mean streamflow. Since 1950, the largest number of streamgages reporting new record highs in any one year was six percent, which occurred in both 1965 and 1997. The 7-day low flow is defined as the lowest average streamflow to occur on seven consecutive days in a year. The number of new all-time record 7-day low streamflows that have been set annually since 1999 (the year when the current period of widespread drought began in the U.S.) has been well-below the number of records set during previous multi-year drought periods, such as those of the 1950s and 1960s. In 1954, 1964, and 1977, for example, seven percent of the streamgages set new all-time record 7-day low flows. The USGS operates a network of nearly 7,400 streamgages nationwide, many in real-time. Current information derived from these stations is available on the web at http://water.usgs.gov/waterwatch. 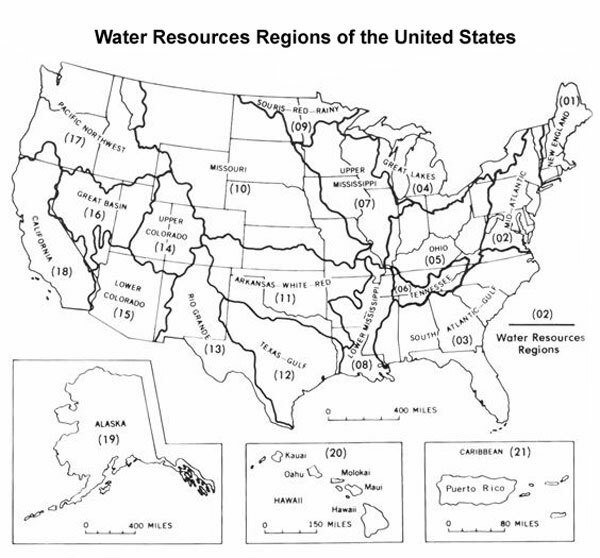 Tables of data that summarize historical streamflow conditions by State, beginning in the year 1900, can be accessed at http://water.usgs.gov/waterwatch/?m=statesum. These tables are updated every few months to reflect the most current streamflow data. The streamflow information used to prepare this summary is also used for water management, monitoring floods and droughts, bridge design, and for many recreational activities. To obtain real-time and archived streamflow data and information, visit http://water.usgs.gov/nwis. Although the national streamgage network is operated primarily by the USGS, it is funded by a partnership of 800 agencies at the Federal, State, Tribal, and local levels. For more information about the streamgage network, see http://water.usgs.gov/nsip/. Page Contact Information: Office of Surface Water.